The Wind Motion is 100 per cent self sufficient meaning its owner can stay at sea for eternity - provided they have enough food and water. At 230ft (70m) long, the enormous vessel would almost be the size of a football pitch. It can sleep 26 people (12 guests and 14 crew) and even has its own spa and pool. Mr Ruhl, 40, has been designing superyachts for 15 years, but his latest project means the super-rich can sail indefinitely, if they wanted to. 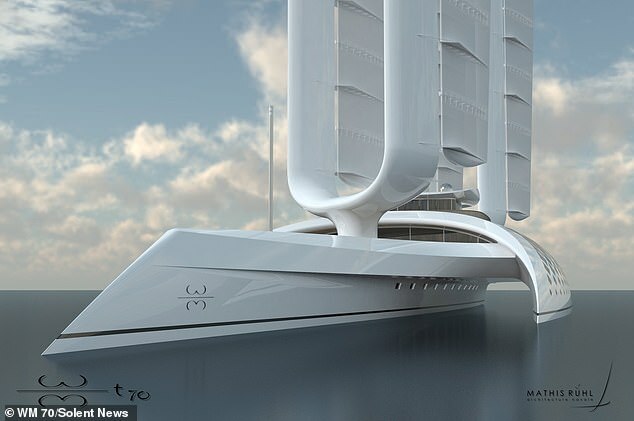 In charging mode, eight hydraulic wind turbines 33ft (10 metres) in diameter unfold from the aluminium sails and recharge the engines and the yacht's batteries. 'The wind turbines act as a charger for the batteries and with the use of hybrid propulsion engines it is possible to use electrical power to propel the yacht in a clean mode', said Mr Ruhl. The unique boat, which has a cruising speed of 20 knots (23mph), is the first to use a special type of rigging system. 'This superyacht is a completely new breed of vessel and there is nothing like the rigged system anywhere else in the world', he said. 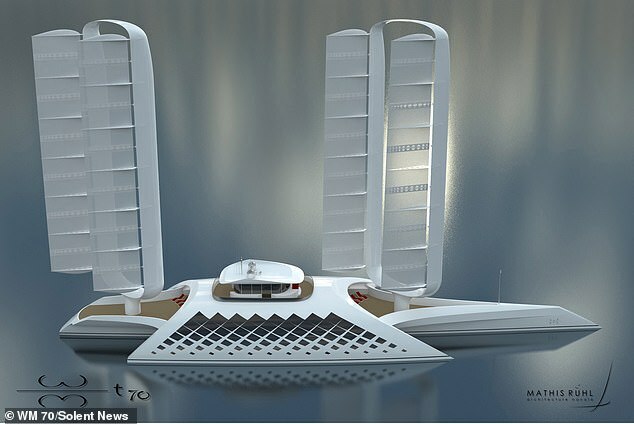 'The rig operation will be automated in two stages, firstly the wind turbine blades will be stopped in the vertical position so that they will completely disappear in the thickness of the mast. This rig will allow for greater stability and reduced movement while the vessel is moored as well as in strong wind conditions. 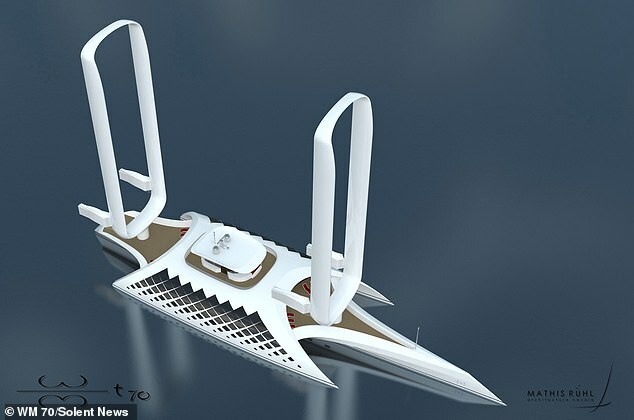 'The floating sides ensure the stability of the yacht and also host the crew cabins in their lower part and the guest cabins at the main deck level', said Mr Ruhl. It is not clear when the yacht will be available to purchase. 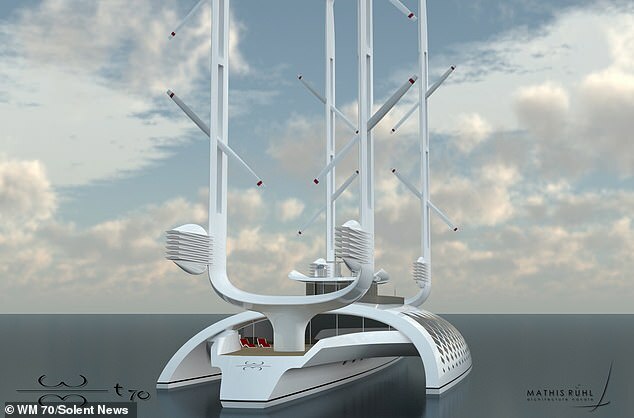 The Wind Motion is one of many eco-friendly yachts set to shake up the industry in the near future. 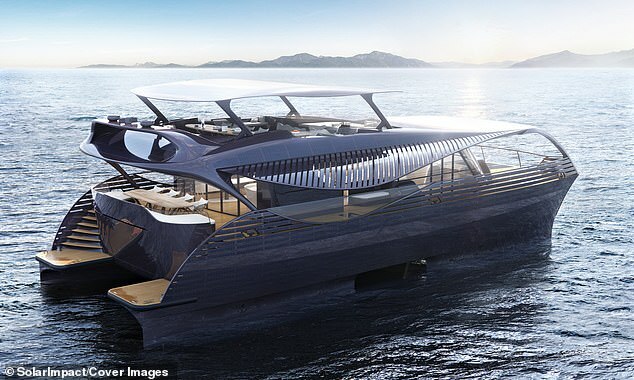 Revealed in September, the electric SolarImpact yacht relies on enough solar panels to cover a full-size tennis court. This cuts a significant amount of noise, the Swiss designers said. 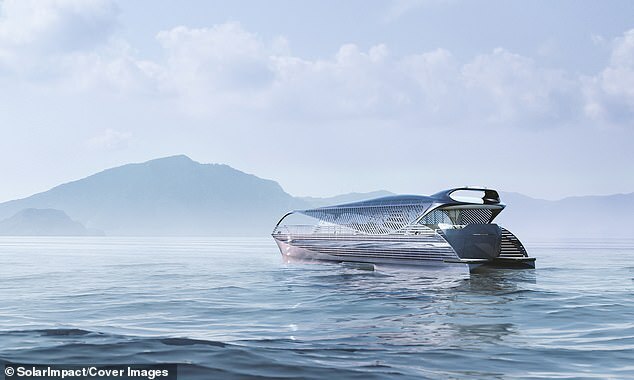 The boat, which is longer than a blue whale at 78ft (24m), can sleep ten people and a small crew, and is loaded with artificial intelligence that allows it to be driven by a single person. 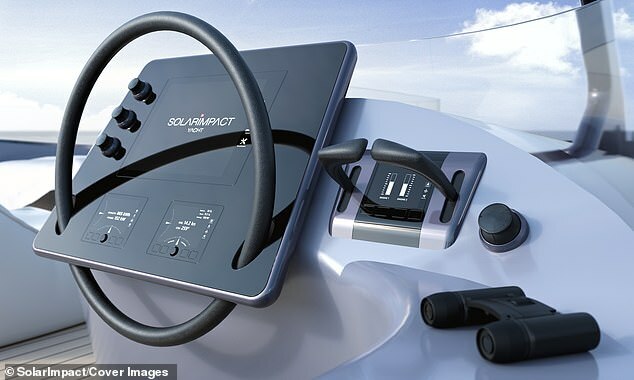 The yacht is the result of five years of research by Zurich firm SolarImpact Yacht AG, which has not revealed an expected price or release date for its design. 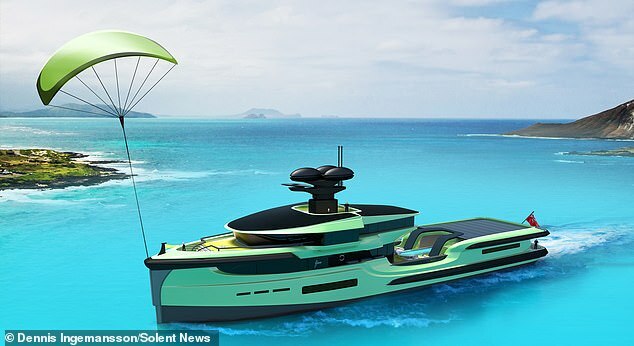 In case there's no sun, another superyacht, The Green Expedition, can be assisted by its retractable wind and wave turbines, as well as the skysail, which is a kite-like rig capable of propelling the ship. Costing £80 million ($102m), the boat is covered in more than 200 square metres of solar panels and can last at sea for more than 60 days. Sleeping 12 guests and up to 20 crew members, it will even be equipped with its own helicopter and a mini-submarine which can dive to an incredible depth of 300 metres.